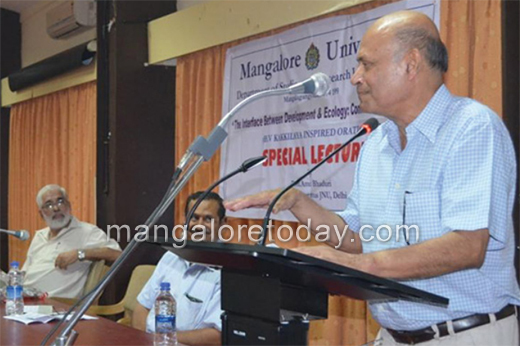 Mangalore, Aug 23, 2014: Delivering a special lecture on the topic ‘The Interface Between Development and Ecology: Conflict and Cooperation’ as a part of B V Kakkilaya Inspired Orations 2014 organised by Hosatu (Bangalore), M S Krishnan Memorial Trust (Bangalore) and Samadarshi Vedike (Mangalore), in Mangalagangothri on August 22. Noted Jawararlal Nehru University (New Delhi) Professor Emeritus Amit Bhaduri, said, Capitalism and liberalisation in India’s policy making has resulted in the destruction of ecology. He further said that corporate sector, which is the largest organised industry, increases GDP but destroys jobs, thus livelihood. Countries like India and China which have seen positive growth in GDP have their job growth comparatively low. Prof Bhaduri said “the labour productivity in industries is higher. A worker in an industry produces six times more than that of a worker in an unorganised sector. But, increase in the output results in the decrease in jobs. The largest companies had to cut jobs owing to the emphasis on mechanisation, standardisation which were directed towards increasing the output.” Though opportunities to education have expanded, job opportunities have not been extended, he said and noted that regular job opportunities are rarely accessible to poor due to the divides in terms of language, caste and religion. The agenda of the governments till date has been to improve the investment climate in the nation. But, to make this happen, incentives are given in the form of environmental resources. Land is taken from poor and a substantial part of the land meant for public purpose, is being handed over to real estates, against a large sum of money. Lamenting that land acquisition bills are made much more favourable to businesses, Bhaduri said there is a starve or fight situation with the poor people. He further said that privatisation of sectors including the health, have forced the poor to avail debts, which results in lack of social security, Bhaduri said. Calling government’s decision to give more emphasis on international market than domestic market, a wrong notion, Prof Bhaduri commented that politicians have always been eager to maintain international standards in Indian market to increase exports. He noted that the government being more favourable to capitalist class is awaste of social democracy and this is being done with the notion of national development. He meanwhile questioned the relevance providing nearly two trillion rupees to large corporations, in the form of subsidies. Prof Shripathi Kalluraya and Prof Surendra Rao were present. The lecture gave deep concepts for proper thinking in the human realm.